When Triple R Ranch opened its gates for the first time, horses were an important part of the Ranch's plans. We meet adults today who still remember the names of their favorite Triple R Ranch horses from when they were kids! Horseback riding is still an integral part of Triple R Ranch year-round. Our riding program is supervised and taught by well-trained, qualified instructors who uphold safety as the top priority. With this focus in mind, we are proud to offer a variety of equestrian learning opportunities. Trail rides are offered for individuals and groups throughout the fall, winter, and spring on Thursdays and Saturdays. (Not availability during June-August). 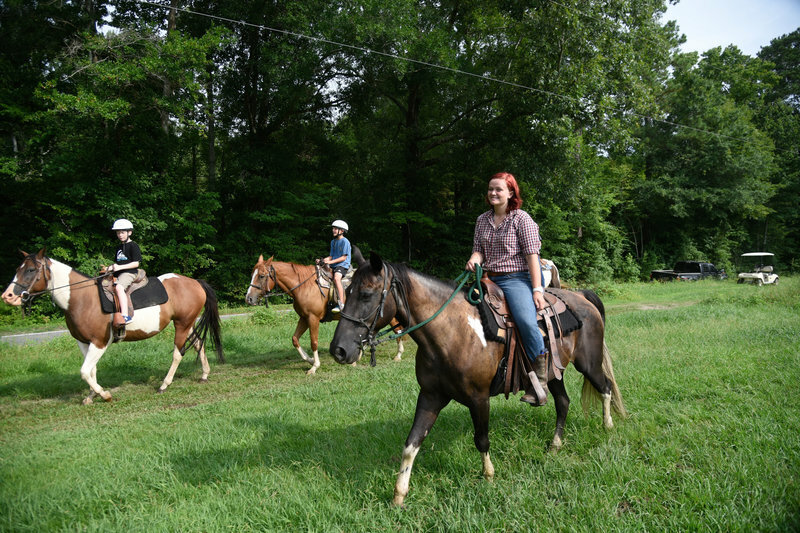 Our trail rides are hour-long rides, guided by our wranglers, that take you into our trail network in the beautiful woods and ride by scenic pastures. All trail rides must be paid in full at the time of the reservation. All riders must be 8 years or older to participate in a trail ride. We offer pony rides for children age 7 years and younger. To protect our horses, we have height and weight limits. We may ask you the height and weight of all the riders in your group before you book so we can have the best fit horses ready for you. Proper Attire Required - Long pants, close-toed shoes (preferably a boot with a 1" heel but tennis shoes are fine), and a SEI-approved helmet is necessary for all riders under 18 and offered for riders 18 and over. Triple R does provide appropriate helmets, but you may bring your own. *We do make exceptions for children age 7 and younger for trail rides. We will require a barn assistant for an additional $25 to walk alongside the horse of your child. This must be arranged ahead of time with the barn manager to ensure we have enough staff. While taking lessons at Triple R Ranch, riders will work at their own individual pace. We encourage growth in their riding skills and build upon these skills as they complete each stage of our riding program. Please note: Keeping safety in the forefront, all first stage riders begin at the Foundations level. SPRING GROUP LESSONS *registration will open March 1st* - group lessons are in eight-week sessions once per week for students 8 years and older. Lessons last an hour and a half and begin on Saturdays at 9:00am, 10:30am, 1:00pm and 2:30pm. Group lessons are $280 for all eight (8) lessons. Registration deadline is Monday, April 22nd. You will be notified of your lesson time by Wednesday, April 24th. Proper Attire Required - Long pants, a boot with a 1” heel, and a SEI approved helmet is necessary for all students. Triple R does provide appropriate helmets, but you may bring your own. Cancellation Policy - If you are unable to attend your regularly scheduled lesson, Triple R Ranch is not responsible to offer a make-up lesson. In case of inclement weather one of the Triple R Ranch staff will call and let you know if lessons are cancelled. We will offer up to two make-up lessons due to weather and will be credited to your online account as soon as possible. Pro-rate Policy - We are able to pro-rate the cost of the group riding lesson package based on the number of dates the student will be able to attend (up to two lessons). If the student or parent/guardian is aware of the dates the student will be missing and gives notice by the starting date of lessons, the cost of the session will be adjusted accordingly. This policy is not applicable for simply missing a lesson or if you have already received the full-payment discount. Notice must be given by the starting date of lessons to the Registrar. This policy is not applicable to any absences made know after the time of registration. We hope this will help as families are budgeting and scheduling out the school year, and we hope you make riding at Triple R Ranch a part of that schedule! Contact the Registrar at camp@triplerranch.org or call the Office at 757-421-4177. Full Payment Discount - If you are paying in full for all 8 lessons by the first day of classes and not receiving a pro-rate, you will receive $20 off the total fee. If you have any questions, please contact our office at camp@triplerranch.org or 757-421-4177. If you prefer to have one on one instruction, private lessons will provided you with an environment that helps you progress more quickly. Instructors will identify and address area that need attention and then spend the time to help you perfect your skills. Our next session of Private lessons will be in Spring 2019. SPRING PRIVATE LESSONS FOR AGES 3-5 *registration will open March 1st* - privates lessons are in eight-week sessions once per week. Lessons last an hour; please indicate your availability on the registration form or contact the Registrar. We will work with you to find the best time for you and our instructors. Private lessons for Ages 3-5 are $280 for all eight (8) lessons. SPRING PRIVATE LESSONS FOR AGES 6 & UP *registration will open March 1st* - group lessons are in eight-week sessions once per week for students 8 years and older. Lessons last an hour and a half; please indicate your availability on the registration form or contact the Registrar. We will work with you to find the best time for you and our instructors. Private lessons for Ages 6 & Up (and we mean up) are $400 for all eight (8) lessons. CANCELLATION POLICY - If you are unable to attend your regularly scheduled lesson, Triple R Ranch is not responsible to offer a make-up lesson. In case of inclement weather one of the Triple R Ranch staff will call and let you know if lessons are canceled. We will offer up to two make-up lessons due to weather. The Special Equestrian program at Triple R Ranch uses the movement and interaction of a horse to help individuals with physical disabilities. 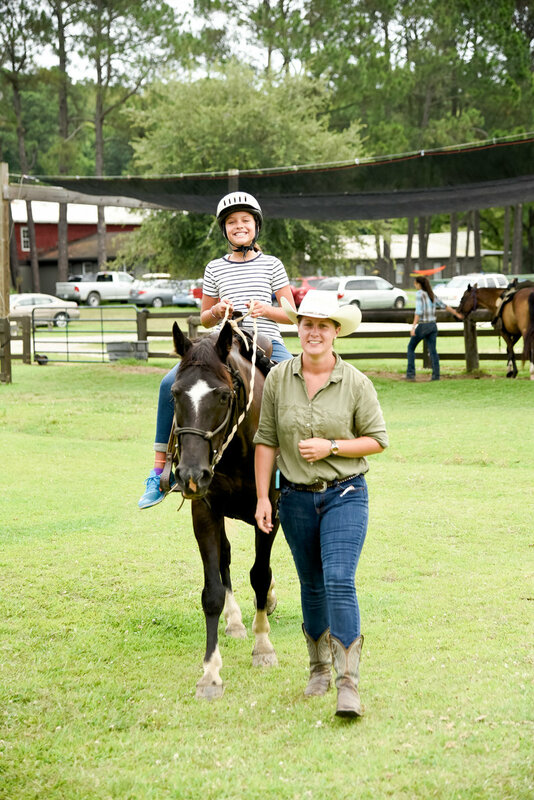 This therapeutic riding program can help participants improve balance, core strength, flexibility, muscle tone, posture, coordination and self-confidence. 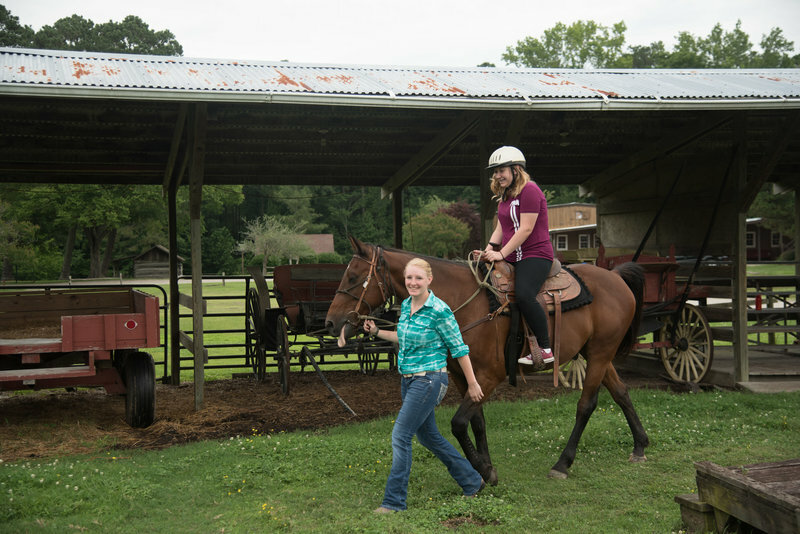 Special Equestrians are dedicated pleasure riding lessons for the disabled. It is our pleasure to be able to provide this program with our gentle horses and helpful volunteers. There are two sessions every year in the spring and the fall, which each consist of eight weekly lessons. Volunteers are an essential part of Special Equestrians, requiring three per participant (a horse handler and two side walkers). When you volunteer with Special Equestrians, you help people achieve things they may have never thought possible. You do not need any experience working with horses or individuals with disabilities. We will train you. We are always looking for volunteers who are committed and are reliable, willing to learn and be respectful to others. SE Spring Classes: Every Thursday from March 7th through May 2nd (NO lessons on April 18th for spring break). CLASSES ARE FULL AND REGISTRATION IS CLOSED. SE Fall Classes: Every Thursday from September 19th through November 7th.